On those pages you can read about the complete training in Energetic Emission Analysis, as well as the training in the therapies of Esogetic Holistic Medicine with the focus on Colorpuncture according to Peter Mandel. Both trainings are offered in a very compact format, with the intention to use an intensive learning process to guarantee a training that is streamlined, efficient and quickly starts paying dividends. On the other hand we are offering seminars which introduce self-contained systems like the OGT (Ophthalmotropic Genetic Therapy), the Induction Therapy or the Crystal Therapy according to Peter Mandel. These seminars can be attended without previous training in Esogetic Holistic Medicine. These systems can be integrated in any practice or treatment concept – and those who become acquainted with them will recognize the enormous new possibilities that open up! The program is completed with the update seminar and the practical workshops. Peter Mandel’s research takes into account the most current insights of medicine and science and repeatedly creates new results and therapies, which can be used in daily practice. These cutting edge developments, as well as structural innovations are passed on to trained therapists in the update. The workshops then supply the necessary space to create a routine and gain confidence in using the acquired knowledge in a practice setting! The goal of our training concept is a dynamic presentation of complex knowledge and its application in daily practice. It is also our intention to share the successes of Esogetic Holistic Medicine through an international presence. Prerequisite to participate in the training cycles of Esogetic Holistic Medicine is a medical training that has been completed or is in progress and will be completed by the time of the exam. Always in writing (mail, fax or e-mail). Your application should be received by us four weeks before the start of the seminar.As we are assigning spaces strictly in the order that the applications are received we do recommend an early sign-up. Our statement of acceptance or bill will be a binding agreement of your participation on our part. The current fees can be found in the catalogue of the seminars. The fees stated in the catalogue include extensive materials that are exactly tailored to the content of each course. We are asking for a timely payment of the bill for the seminar. We are operating under the general business terms of the esogetics GmbH (for Switzerland: the general business erms of the esogetics GmbH, Zweigniederlassung Luzern). With this introductory seminar we want to offer you a glimpse into the world of Esogetic Holistic Medicine. You become acquainted with the procedure of energy screening, among others the Energy Emission Analysis (EEA) according to Peter Mandel. We are using case studies to discuss the beneficial consequences of treatment. You will also find out more about the so-called 3 levels of the ‘whole’ : matter/body, energy/ soul/emotion, information /spirit/mind and their extremely sensitive interplay, which can be clearly seen in the EEA image. Case histories will be used to demonstrate the beneficial results of the method. The EEA is the first link in the chain of Esogetic methods and serves as a starting as well as a completion point in the care of the patient. The EEA gives us an overview of all disease tendencies and disturbances within the human system. It permits a quick comprehension of the overall situation of the patient, points towards medically relevant issues and is a reliable monitor for the therapeutic process. The criteria of emission quality, emission phenomena, localization and the relationships of the phenomena amongst each other present a common thread, which allows us to draw conclusions about the subconscious structures and peculiarities of an individual. That enables us to address the stress quasi ‘from the tail end’, because the symptom is not the main focus of our analysis, but we are looking for the cause of the symptom. The EEA topography and its types of emission, basic and special phenomena. The process of screening and the reaction test in the EEA: stresses that decrease the regeneration ability of cellular and neuronal structures. The hierarchy of the physical, emotional and mental topography. The psychological interpretation of the picture and the patient’s individuality in body, soul and mind. Stresses from emotional and/ or physical childhood trauma. Extensive case studies and practical exercises. By completing parts 1 and 2 of the basic training you have acquired a wealth of detailed knowledge in analysis and therapy to use in your own clinic. Analysis and therapy of aggressive inflammatory complaints, for instance tonsillitis, chronic rhinitis or inflammations of the ear; detoxification therapies. Correlations between analytical findings and the function circles. Therapeutic options to address the function circles. Extensive holistic therapies, case studies and practice exercises. With the completion of the Advanced Training you have an all encompassing evaluation and therapeutic concept to be successful with your patients. fire- earth – water – air and ether. The connection between the basic patterns ( endocrine, toxic, degenerative) and the 4 + 1 elements (principles). The diagnosis and therapy of the 4 + 1 principles, esp. the psychological correspondences. Assignments, evaluation and holistic supportive therapies for systemic diseases, cancer, Aids and very severe diseases. Assignments, evaluation and holistic supportive therapy of the principle: element air – condition after stroke, acute and chronic arm and shoulder pain, arthritis of the joints of the hand and fingers, diseases of the lung, the ears, acute or chronic, tinnitus, recurring bladder problems, incontinence, prostate, systemic diseases. Assignments, evaluation and holistic supportive therapy of the principle: element water – endocrine/ autonomic stresses, diseases of the endocrine system, the stomach and the female breast. 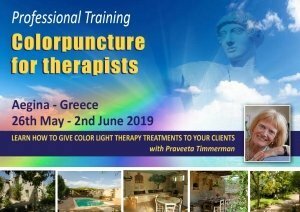 The integration of the EEA and therapy trainings in colorpuncture of Esogetic Holistic Medicine. Here we go to the core – the individuality of the human being. Everything we have learned so far serves this purpose: To be able as a therapist to approach the client as closely as a possible as an individual and an individually reacting being. The more differentiated the various analytical clues can be perceived and the better the understanding of the hierarchical levels is, the more obvious will the best holistic therapeutic solution be and the greater its resulting success. Therapy resistance challenges us to continuously look for new options – not only for therapy, but especially for expanding our perceptive ability to grasp the individuality. Thus the education of the “inner eye” is the big topic of the Intensive Week. In order to gain clarity and confidence in our choice of therapy, we need confidence in our evaluation skills. 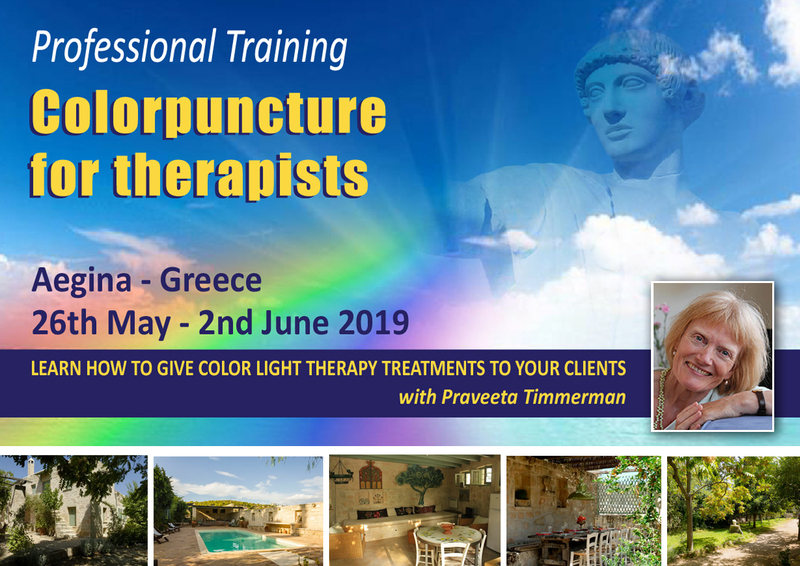 By completing your training you have the option of taking an exam to qualify as a therapist for «Esogetic Holistic Medicine according to Peter Mandel» and «Colorpuncture according to Peter Mandel». Each therapist is responsible to obtain the required professional license in their state/ district/ county to practice as a diplomate. Colorpuncture according to Peter Mandel has been recognized by many private health insurers in Germany and Switzerland ( with the additional insurance for alternative medicine).